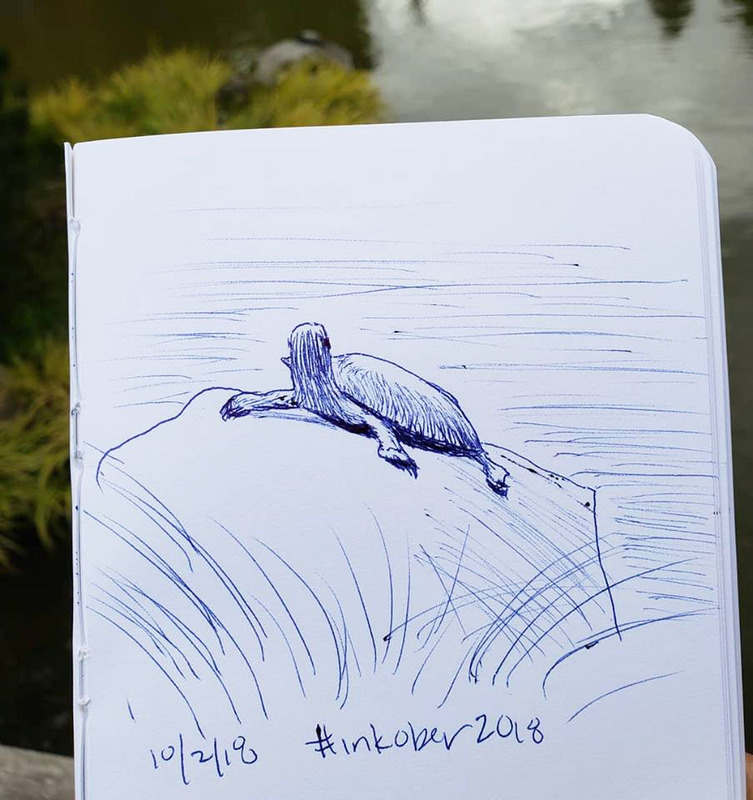 Usually my InkTober insights don’t come until later in the month, but less than a week into it, I’m already learning. As mentioned on Day 1, I am once again committed to exploring ballpoint during InkTober. I’ve tried in previous years, but I always gave up after a few days because the material annoyed me, and I didn’t like the clunky results. This year, though, I’m determined to stick it out. My first couple of days with a Bic Cristal were as clunky as ever because my hatching is rusty, and I questioned why I so masochistically insist on struggling with ballpoint. On Day 3, however, I remembered that Bic ballpoint ink can be built up gradually in layers, almost like graphite. It’s also pressure-sensitive the way graphite is. Since pencils and I have a good relationship, I wondered if I’d have a better time with ballpoint if I treated it more like graphite. 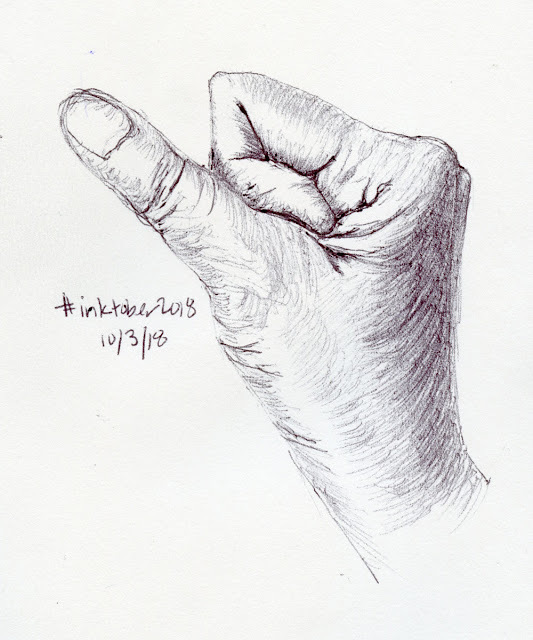 I still used hatching for this sketch of my hand, but I also varied the pressure, and I was pleased with how faint a mark I could make when I applied very light pressure. It really is the “pencil of pens”! It was a gratifying discovery that encouraged me to plunge forward with ballpoint. 10/3/18 Day 3: I discover the "pencil of pens"
The next day, however, was a setback. I had been using a fat 1.6mm Bic Cristal, which has a bad habit of leaving unintended blobs of ink, so I dug through a kitchen drawer for a Bic Stic pen (the ubiquitous kind we all find in hotel rooms), which has a finer point. The mistake was taking it to life drawing. Even during a 20-minute pose, I didn’t have enough time to hatch it properly, and my results were less than satisfying. That experience reminded me that ballpoint is like pencil in another way: I have to allow enough time to use it well. 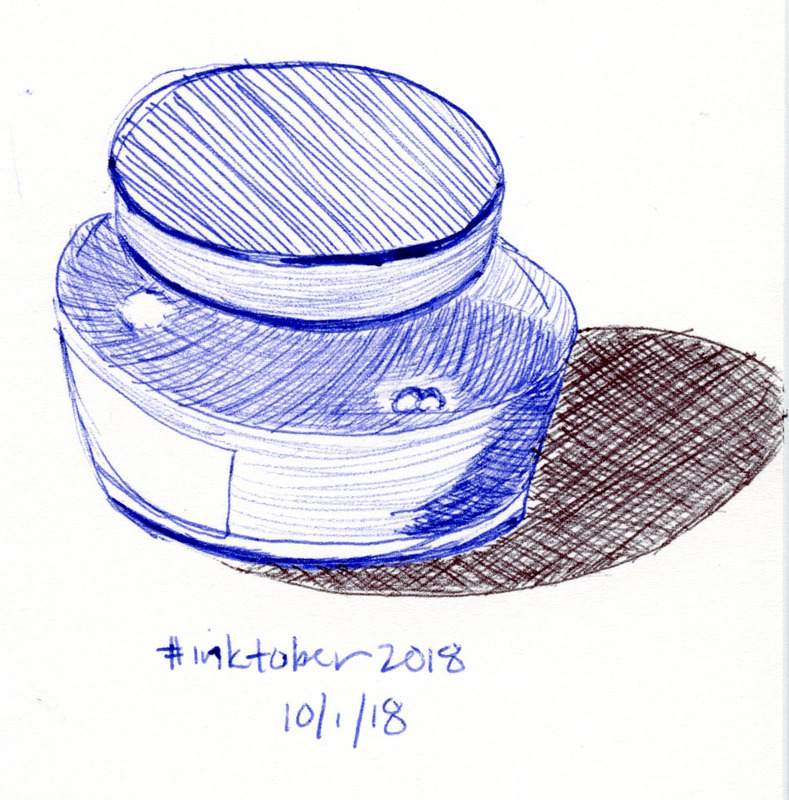 10/4/18 Day 4: Ballpoint and life drawing don't mix. Day 5 dawned wet and cold, so I went to Zoka, my favorite coffee shop for sketching. This time I tried something different again. Although I’m not a fan of writing with ballpoint in general, I always carry a Uni Jetstream 4 & 1 in my bag for times when I need an implement to grab quickly, like when I’m signing a credit card slip or jotting a note to myself. 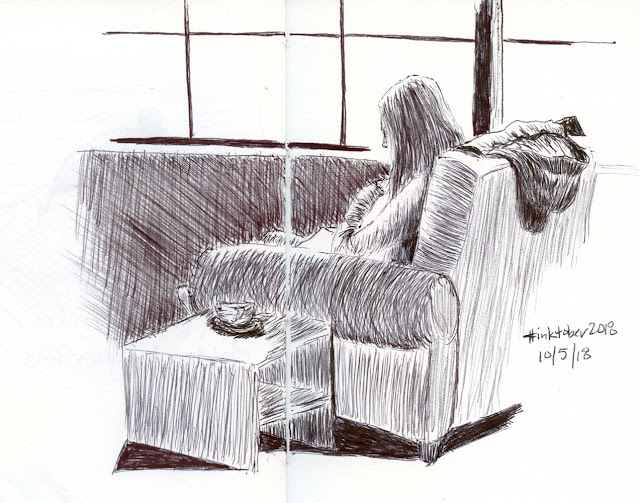 Its 0.7 mm tip is much finer than the Cristal’s 1.6mm, so as long as I was thinking of ballpoint as graphite, I decided to use the Jetstream as an “HB” and the Cristal as a “4B.” Sketching a woman reading next to the windows, I found the hatching process to be meditative and relaxing (top of post). Using “grades” of ballpoint seemed to help me adjust values better and stay in a (happier) pencil frame of mind. The biggest discovery came yesterday, Day 6. 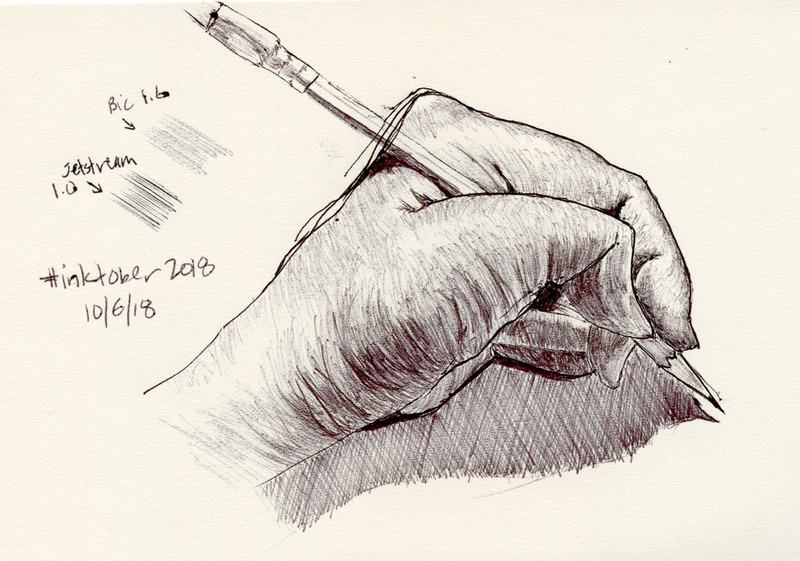 Continuing to think of my Jetstream as an HB grade pencil, I used it to draw the contour line of my hand holding a Blackwing (from a photo this time – how else would I get to draw my left hand? 😉), and that’s when I realized that it’s not possible to get a pale mark with it as I can with the Bics. (see my test hatch marks shown to the left of the sketch.) With the Bic, I can make the initial contour line light and darken it along with the tone as the drawing progresses (see the previous hand sketch). The Jetstream’s ink formulation is smoother and flows more consistently than Bic’s, which makes it pleasant to write with. But that same characteristic makes it harder to apply in varying densities by changing the pressure on the point. I abandoned it after finishing the too-dark contour line and switched to the Bic Cristal for toning. 10/6/18 Day 6: I get it now. I get it now: This is why so many ballpoint artists seem to favor the lowly Bic. It’s a pressure-sensitive medium that can be applied gradually in layers of tone. The more I think of a Bic as a pencil, the more I like it. I think the rest of InkTober is going to be more fun, now that I’ve figured out how to approach ballpoint. Gee, Tina, you never stop exploring new sketching tools! I think your sketches on day 3 and 5 are lovely. I don't think I'd use fine-tipped pens/pencils for life drawing, even with a long pose. For a still pose, I think brushes create a soft flow all over the model's body. You reckon? Oh, I agree completely, Ching -- I prefer brush pens (with the ink already inside) for life drawing, which are much more fluid. Although lately I've been enjoying soft colored pencils, which are almost like charcoal in developing tone. Glad you had your "a-ha" moment early in the month. Even though I enjoy drawing with ink, I've never really tried hatching or shading with a ballpoint pen. Maybe before the month is over I will give it a try. I like how you frame this writing implement as a familiar tool like the pencil. By the end of this month, I predict, you'd have a new "friend" to go with your sketchbook. Wow! I love your new sketches! I’m going out to buy a Bic stick pen now! It’s That #InkTober Time of Year Again!